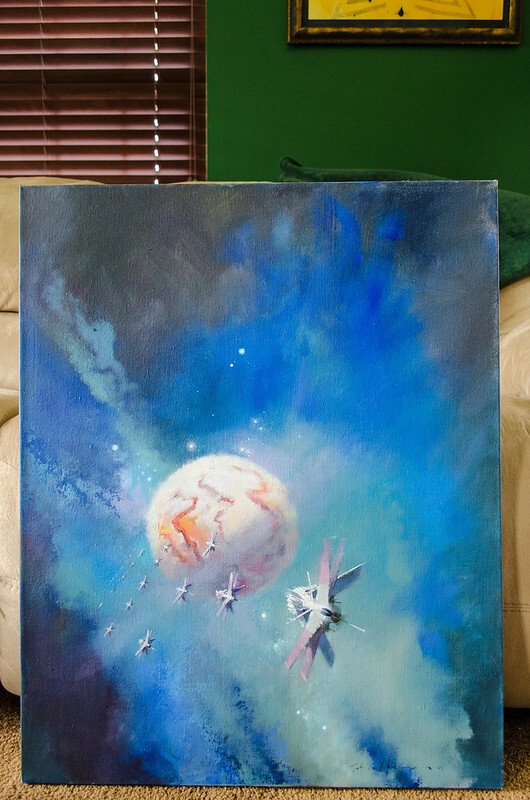 Yup, it’s the trade paper (and subsequent printed editions) cover to Old Man’s War, painted by John Harris, who has gone on to do all my subsequent Old Man’s War series covers. The painting went up for sale recently, and because I’m a fan of Harris and also it’s the cover to my first ever published novel, I inquired as to whether I could purchase it. Turns out, I could. This will be the second time I’ve purchased the Old Man’s War cover art; I also own the original hardcover edition art, painted by Donato Giancola. It’s nice to have them both under one roof. This is a good time for me to promote once again Harris’ new book The Art of John Harris: Beyond the Horizon, which includes a foreward by me; it’s available in standard and special limited editions. It’s gorgeous (the pages linked are UK-specific but the book is available in the US as well). Also, here’s a discussion by Harris and me about some of the work that he’s done for my writing. Anyway: I’m geeked out at the moment. I get to own this painting. How cool is that. 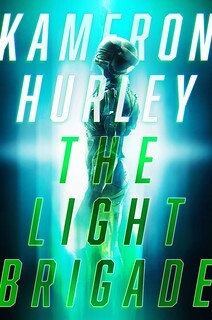 How did they transfer it from canvas to (presumably) digital, for use as the printed book cover? Scan? Hi-res photograph? I’d say that’s worthy of pants. That is all the cool. I’d never noticed the sorta Spider-Man-esque 3D weave behind the title text, there. Interesting that it’s not in the painting. That’s really cool, both because it’s a great painting on its own and because of its association with your novel. I have a question as a would-be artist who doesn’t spend enough time at it to be very good: do you know if it’s acrylic? It looks like the background is done wet-in-wet, which I know can be done in acrylic, but I’ve never tried. If you look closely at the weave (you’ll see a better view of it on the back cover), you’ll see it’s a wireframe of a human head. Gorgeous! 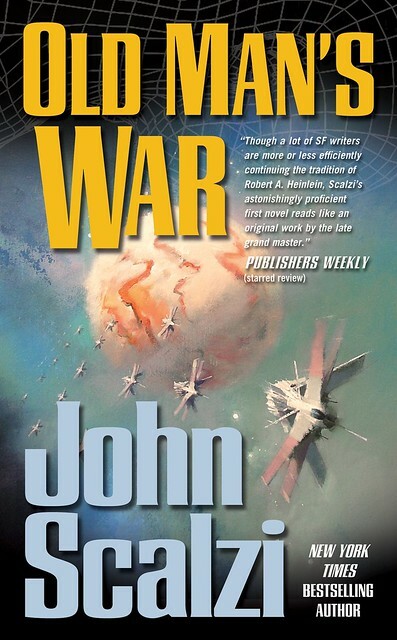 I thought the cover for Ancillary Justice looked familiar but I didn’t realize it was the same artist as Old Man’s War. I like his style in that it captures the beauty of space and space craft while also being technical. No idea. I think it depends on the author, and of course whether the author likes the art. Also, these days a lot of art is done digitally, so there might not be an “original” outside of a file. Love it, very cool. Voted for John Harris for the Hugo this year. His art work for Ancillary Justice was so perfect. That’s just damned cool. It’ll look good framed & on your office wall. @Brian: They essentially take a very high quality photograph of the canvas picture and then go to work in the editing software. 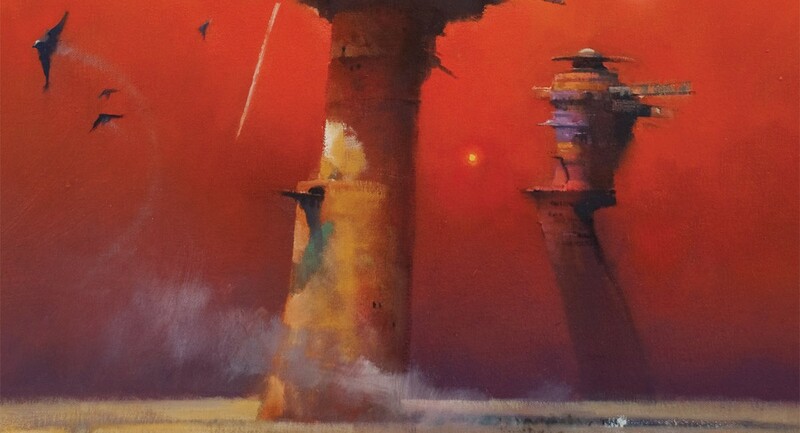 I want to cover the inside of my room in John Harris posters. Do those exist? Just kidding, that’s really cool. Congratulations! @MrManny A quick Google search turned up some prints and a collected works book, I didn’t immediately see any posters. Note that a publisher that has used an artwork likely has a set of rights to its use, and you may only be able to find that work as a promotional poster, or on the book. Let’s see, “cool” is taken. “sweet,” taken. “awesome,” sweet, it ain’t. On the purchase of posters or prints, some artists don’t create those because replicating an original is very difficult, and sometimes you just can’t get the colors right. There’s an artist whom my husband likes a great deal, but many of his works aren’t up in print form because he has a particular love of certain saturated tones that get dulled down when it comes time to print, and the prints look muddy. Marvellous! I love sf art and have commissioned work from David Hardy a couple of times. We also have a Jack Vance cover by Jim Burns. “The Twin Parliaments of Pyrrhus” belongs on my wall. I’m a big John Picacio fan but I think this year my Hugo vote is going to John Harris. Every time I look at his work I’m liking it more and more. Congrats on the purchase, that’s really cool. B. Durbin: I’ve seen that in photography. The professional can’t get a good pic from a perfect negative. Why not? Because he wasn’t doing anything; He used the default settings on his machine and the most popular (cheapest) contrast of paper. For printing from a computer I know next to nothing? ‘K? When trying to print out something that had blackest black I got muddy black because the ink jet cartridge for black was, according to the software (which didn’t tell me and was wrong), empty. I’m pretty sure that the last time I looked was early this century and their was a very expensive eight(?) toner colors plus black printer that could do what I recall as small posters. Perhaps 12 inches wide? Anyway, what I’m saying is that in my opinion those saturated tones _are_ doable on posters, just not for a profitable cost. re. Shawn T, if I remember correctly, Ansel Adams got a whole book out of the subject of printing a photo from a negative! Today you photoshop the image before printing. I like the OP art better without the wireframe. Clutter added to art by a ‘graphic designer’ is not an improvement, imo. I too voted for Harris for the Hugo this year. Most of his work in the voters packet happened to be from a certain serialized novel that went out last year. We own a couple of Harris paintings, and they are wonderful. 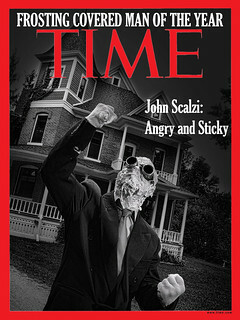 Also, SF Revu has an interview my husband and I did with John this month. Conga rats on the nifty buy! There are a number of illustrators whose works I love, but their works aren’t available in repro, and originals a. are hard to come by, and b. can be quite pricey.. I know it’s abstract and the artist probably didn’t mean it to represent any particular part of the novel, but does it scan to you as being of a particular scene in that universe (whether in the story or not)? That’s beautiful! Now just make like-sized copies of the novel’s text and attach. Instant coffee table classic.